It is of Galactic's newest release, Carnivale Electricos. Jazzfest is right around the corner and RtBE is getting giddy, what better way to get juiced for the proceedings then to review one of the hardest working bands that city has to offer? 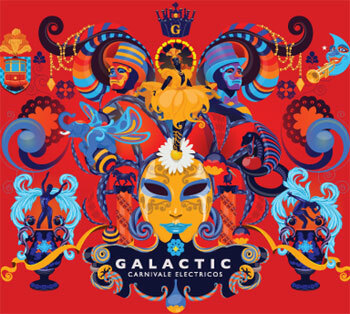 Galactic have killed it recently representing their hometown expertly on their last release and tour. Carnivale Electricos continues that trend gloriously with an out and out party put down on wax. New Jack White - Blunderbuss Streaming Free Now! Levon Helm Health is Failing. Dylan Cover #44 Jimi Hendrix "Drifters Escape"
Dylan Cover #43 Esteban Paez "Maybe Someday"